Home / Hidrate Spark / Review: "This Bottle Makes An Excellent Addition To Any Home"
Review: "This Bottle Makes An Excellent Addition To Any Home"
I have been using this bottle for 2 weeks now, and I have found that I drink on average 3 times more water than I did before I had this bottle. Being able to see how much water I need to consume based on my activities, the weather, or any other factors helps me know where I stand. I had previously thought that 72oz of water in one day was an impossible task, now I'm drinking far beyond that. As I sit here writing this review my bottle starts glowing reminding me that it is time to drink more water. The bottle illuminates just the right amount. Enough to get your attention, but not so much that it hurts your eyes. The lid is easy to open, and "locks" in the open position this is helpful when you have to tip the bottle to drink, the lid doesn't come back and hit you in the face. The button on the front is easy to press, the lid closes securely, and creates a leak proof seal. 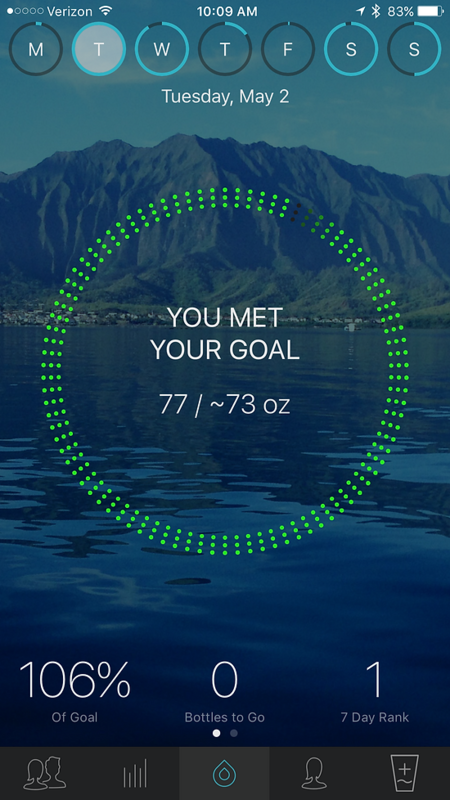 Another awesome part of this hydration system is the app that goes with it. It allows you to compete with yourself, or with your friends. The app is super easy to use and the layout is clean, and uncluttered. For all of the amazing features this bottle, and app offer, I believe there are some features that should be added, or improved. I use a lot of performance supplements, fruit, ect. in my water on a daily basis, the fact that this bottle is water only, and having to change bottles through out the day is a hassle, initial set up is a little tedious, and if you aren't that strong in your fingers/hands or you have arthritis, you are going to require some assistance for the initial set up. There other issue I have is purely a marketing issue, there isn't really any branding on the bottle, sure there is the water drop on the button, but in my opinion the name needs to be up the side so people know who makes it. My rating over all is... This bottle makes an excellent addition to any home. Everyone can benefit from drinking more water, and the glowing light helps, plus its super fun. The bottle is made of top quality plastic, that fits snugly in your hand. The glowing is certainly a conversation starter, and I am proud to tell people about this amazing bottle.